This adorable little plush giraffe from Wild Republic's Hug'ems collection is willing to stick his neck out for you on all your imaginative adventures. 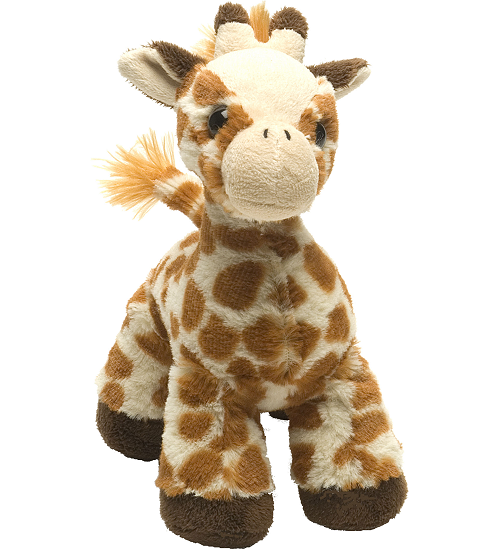 With soft spotted fur of cream and rust, brown hooves and accents, and a fluffy tail tuft, this stuffed giraffe has a huggable body and sweet brown eyes. Designed with nature, education, and helping others in mind, a portion of the proceeds from the sale of this cuddly giraffe stuffed animal helps support foundations which provide housing and education for disadvantaged children, as well as protection for abandoned animals throughout the world. This adorabe little giraffe plush keychain has soft spotted fur, cream and dark brown accents, and a fun loopy mane. 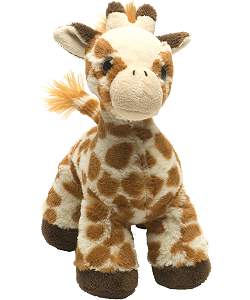 Safari is an adorable giraffe stuffed animal with cuddly soft orangy spotted fur and warm brown eyes.